Born on December 6, 1955 in Leningrad. Graduated from the Department of Asian and African Studies of St.Petersburg (former Leningrad) State University in 1979. In 1979-1982 - doctoral student at the Leningrad / St.Petersburg Branch of the Institute of Oriental Studies (the USSR / Russian Academy of Sciences). 1983 - The Oirat language (based on the text of “The Sutra of Golden Light”). From 1982 up to present - senior researcher at the Department of Turkic and Mongolian Studies at the SPBIOS (now the Institute of Oriental Manuscripts), the Russian Academy of Sciences. 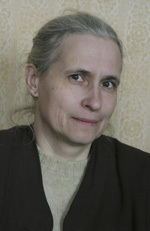 From 1990 till 1995 she was the Academic secretary of the St.Petersburg Branch of the IOS RAS. She is the author of two books and about 40 papers. The Oirat Language of the 17th century which is a grammatical description of the Oirat language and The Oirat Version of the Molon-toyin story which is a translation from Oirat into Russian of a story about Molon-toyin’s journey into the hell (actually several hells) in search of his sinful mother. This theme being rendered in Oirat is different from that known from Tibetan and Mongolian texts. The papers are on some grammar topics both of the Modern Mongolian and Oirat languages, and matters dealing with other texts (e.g. a Mongolian text of Key to Wisdom). and several others in Moscow, Elista and Ulan-Ude. Z.K. Kasyanenko – Teacher and Mongolist. Proceedings of the International Conference devoted to 90th birthday of Russian Mongolist Z.K.Kasyanenko. September 30 – October 1, 2015. Saint Petersburg. Russia. Ed. by L.Bold (editor-in-chief), I.V.Kulganek, B.Tuvshintugs, N.S.Yakhontova (executive editor). St. Petersburg – Ulaanbaatar. 2016. 218 р.
Mongolica-XVI / Editorial Board: I.V.Kulganek (editor-in-chief), L.G.Skorodumova, T.D.Skrynnikova, K.V.Orlova, N.S.Yakhontova. Secretary and Editor of the English text: D.A.Nosov St Petersburg, 2016. 104 p. ISSN 2311-5939. Mongolica-XIV / Editorial Board: I.V.Kulganek (editor-in-chief), L.G.Skorodumova, T.D.Skrynnikova, K.V.Orlova, N.S.Yakhontova. St Petersburg, 2015. 104 p.
Mongolica-XV / Editorial Board: I.V.Kulganek (editor-in-chief), L.G.Skorodumova, T.D.Skrynnikova, K.V.Orlova, N.S.Yakhontova. St Petersburg, 2015. 104 p. ISSN 2311-5939. Yakhontova N. [Review:] The Secret History of the Mongols. A Mongolian Epic Chronicle of the Thirteenth Century. Translated with a Historical and Philological Commentary by Igor de Rachewiltz. Volume 3 (Supplement) // Written Monuments of the Orient. 1, 2015. P. 108–110. Mongolica-XII / Editorial Board: I.V.Kulganek (editor-in-chief), L.G.Skorodumova, T.D.Skrynnikova, K.V.Orlova, N.S.Yakhontova. St Petersburg, 2014. 106 p.
Mongolica-XIII / Editorial Board: I.V.Kulganek (editor-in-chief), L.G.Skorodumova, T.D.Skrynnikova, K.V.Orlova, N.S.Yakhontova. St Petersburg, 2014. 104 p.
Mongolica-X. Collected Essays [Mongolica-X: Сборник статей]. Ed. by I.V.Kulganek (chief), L.G.Skorodumova, N.S.Yakhontova. St Petersburg, Peterburgskoe Vostokovedenie Publishers 2013. 144 p.
Mongolica-XI / Editorial Board: I.V.Kulganek (editor-in-chief), L.G.Skorodumova, T.D.Skrynnikova, K.V.Orlova, N.S.Yakhontova. St Petersburg, 2013. 104 p.
Mongolica-IX. Collected Essays [Mongolica-IX: Сборник статей]. Ed. by I.V.Kulganek (chief), L.G.Skorodumova, N.S.Yakhontova. St Petersburg, Peterburgskoe Vostokovedenie Publishers 2010. 176 p.
Oirat Vocabulary of Poetical Names [Ойратский словарь поэтических выражений]. Facscimile ed., transliteration, introfuction, translation from Oirat into Russian, dictionary with notes, appendices by N.S. Yakhontova. Moscow, Vostochnaya Literatura Publishers 2010. 615 p. (Pamyatniki pismennosti Vostoka, СХХ). Mongolica-VIII. Collected Essays [Mongolica-VIII: Сборник статей]. Ed. by I.V.Kulganek (chief), L.G.Skorodumova, N.S.Yakhontova. St Petersburg, Peterburgskoe Vostokovedenie Publishers 2008. 160 p.
Mongolica-VII. Ed. by I.V.Kulganek (chief), L.G.Skorodumova, N.S.Yakhontova. St Petersburg, Peterburgskoe Vostokovedenie Publishers 2007. 144 p.
On 2-4 July, 2018, the first session of the Eighth Dorjiev Conference will be held in Ulan-Ude and Atsagat Datsan.